Packed with opportunities to learn and play tennis the sessions at the indoor centre in the War Memorial Park will be running from Monday 8th to Thursday 18th April. Sessions are available as morning, afternoon options and there are also both two and five-day packages for children aged from four years old (children must be 5 and over to stay for the full day). Mornings will be tennis orientated while the afternoon sessions also include multi-sports, all players are invited to join in the Easter fun and find all the hidden eggs. Each child should dress appropriately for tennis activities (layers when cold, sunscreen and a hat when hot) and need to bring a packed lunch and drinks, Children will be supervised throughout the day, including lunch breaks. Rackets will be provided for those who need one. Please note refunds will only be given with 24 hours notice and sessions need a minimum number of participants in order to take place. As a result of a cancellation by Totally Tennis an alternative will be offered. Looking for healthy alternative for your children in the February Half Term break? Want your children to have fun and learn a new sport in the school holidays? Totally Tennis has just the answer – Holiday Tennis Camps. Running at both the Indoor Centre in War Memorial Park and Hampshire Court in Chineham from 15th – 19th February, sessions can be booked as morning, afternoon or full day. Tennis camps give children plenty of opportunity to keep active and the camps are not only tennis orientated, although that is the main focus, but combine a variety of sports including swimming (Hampshire Court only), there really is something for everyone. Tennis camps are great fun and include lots of games and mini-competitions for both new and experienced players for children aged 4 – 16 years in a safe environment with qualified licensed and experienced LTA coaches. Each child should dress appropriately for tennis activities and need to bring a packed lunch, drinks and swimming kit (Hampshire Court only). Children will be supervised throughout the day, including lunch breaks and swimming sessions. Rackets will be provided for those who need one. Please note refunds will only be given with 24 hours notice and sessions need a minimum number of participants in order to take place. As a result of a cancellation by Totally Tennis an alternative will be offered. Do you want your child to burn off some energy and have a fantastic time this Christmas holiday? For a healthy and challenging alternative, the Totally Tennis Holiday Tennis Camps are a great way for juniors to improve their skills and fitness while making new friends. Packed with opportunities to learn and play tennis, activities also include football, rounders and hockey. The scheme has received OFSTED accreditation and the sessions are run by experienced Lawn Tennis Association (LTA) qualified and licensed coaches. Tennis camps will be running at the indoor centre in the War Memorial Park for two days on Tuesday 29th and Wednesday 30th December Sessions can be booked for Morning, Afternoon and Full days and can be booked from 9am – 3.30pm. Each child needs to bring a packed lunch and drinks and be dressed appropriately for the weather – bring warm clothing as it will probably be cold! Those coming for a full day will be supervised during the lunch break and rackets will be provided for those that need one. Appropriate inhaler or medication must be brought along if needed and the coach informed. 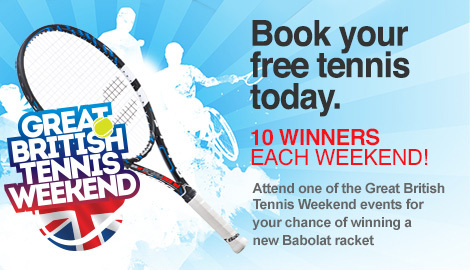 For more information and to book, please telephone the office on 01256 368816, e-mail tt@totallytennis.co.uk or visit the website http://www.totallytennis.co.uk. Don’t forget all the family can play tennis for FREE tomorrow at Totally Tennis. 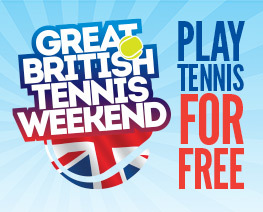 Sessions will be available on Sunday 18th May from 1.30pm – 4.00pm at the indoor centre in the War Memorial Park as part of the Lawn Tennis Association’s (LTA) Great British Tennis Weekend. The adult drills taster session is ideal for everyone new to the sport or those who haven’t picked up a racket in a long time. Rackets can be borrowed if you don’t have your own, just come prepared to hit a few balls and have some fun. No matter what your ability you will have fun on court with other junior players of your age. Totally Tennis Coaches will be on hand to offer tips to help your game and advice on how you can continue to play to improve and for further enjoyment. So grab your racket (rackets provided for those who don’t have their own) and get on court with your family and have some fun. Modified balls and rackets will be provided for the younger ones and coaches will be on hand to give the whole family some pointers if you want them. There will also be face painting, bouncy castle, cakes, tea, coffee and the coach rally challenge. Don’t delay book today online here by clicking on this link www.clubhouse.lta.org.uk. Please telephone the office on 01256 – 358816 for more information and to join in all the fun.